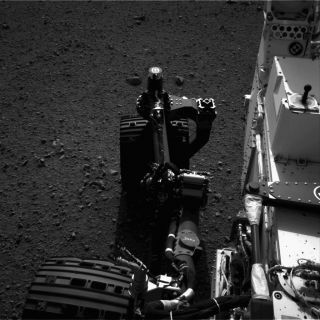 This still from a set of images shows the movement of the front left wheel of NASA's Curiosity as rover drivers turned the wheels in place at the landing site on Mars. Engineers wiggled the wheels as a test of the rover's steering and anticipate embarking on Curiosity's first drive in the next couple of days. This image was taken by one of Curiosity's Navigation cameras on Aug. 21, 2012.